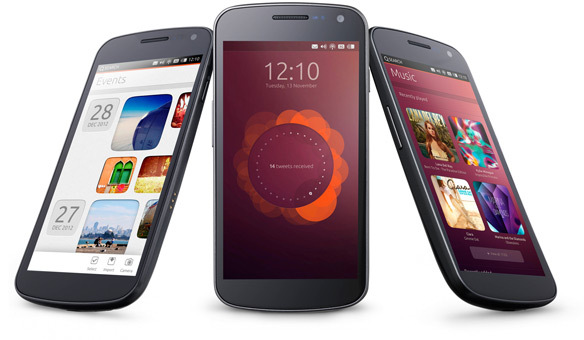 The developers of the popular Linux distribution Ubuntu have showed off an Android based phone OS with no JavaVM running on a Galaxy Nexus phone today. From first look it’s got some slick things that make the UI different from normal Android like swiping from edges to open menus and information, kind of stealing this from how Windows 8 works. From hands on videos it is very slow and things lag when opening. Of course this a early release but it’s nothing impressive. On the website they show a block with app icons and just say “Go make us apps” using HTML5/Native, but lots of those like Gmail and YouTube would never make it to this OS natively just look at the large number of full on Android devices that don’t get support for Google Apps. So its very misleading to people thinking this would be cool to have because somehow it’s going to be more open then Android. The one think I ask is what is the point, right now the big 3 are Android, iOS, and BlackBerry, with BlackBerry slowly dying away and Windows Phone not even something that anyone is looking at. This sounds like a lot of extra resources that could be put into making Android better, or making Ubuntu work better on the desktop. There is also Ubuntu TV but don’t expect much from that ether, their may be money in these markets but trying to do your own thing won’t work out or you will get people who get one of these devices and wonder why they can’t get the apps there friends on Android have. Check out some photos to see what it looks like but don’t hold your breath for this becoming more than a waste of our time. If any new phone OS had any chance other than Android and iOS it would be Windows Phone just because they have the money to lose. And as we have seen from other Phone OS’s such as WebOS and even Windows Phone, just because you are different or have some special features it all comes down to getting things working together and getting lots of phones running it. If this sounds harsh, it’s just true that you shouldn’t expect much to come from this. Posted on January 2, 2013, in Android, Apps, Archive, Google, HTML5, Intel, iOS, Linux, Phones, Ubuntu and tagged Android, Apps, BlackBerry, Galaxy Nexus, Google, IOS, JavaVM, Linux, Phone, Preview, Ubuntu, waste, WebOS, YouTube. Bookmark the permalink. Leave a Comment.